The Frenchman's Food & Wine Blog: Halo Espresso, South Perth - food that punches above its weight! Halo Espresso, South Perth - food that punches above its weight! Halo Espresso, located on 82 Angelo Street, South Perth, Western Australia, is a great coffee shop in the urban-village-style Angelo Street area. While they make a good coffee, you wouldn't at first glance realise that they've got a seriously good chef working in the kitchen. As if the fact that 100% of their profits go towards charitable work isn't a good enough reason to choose to spend your money there, I recently discovered that one of the top young chefs in the world, Morgan Keyte, has started working there. In 2014, Morgan won the Western Australian and then the Australian national stages of the Chaîne des Rôtisseurs Young Chefs Competition to earn the right to represent Australia in the international Concours International des Jeunes Chefs Rôtisseurs, held that year in Durban; where he went on to win best in kitchen and make some invaluable connections with chefs from all around the world. A quiet, modest and hardworking fellow who takes his craft seriously, there is much to like about Morgan. What could someone like that do to what is necessarily a limited and modest cafe menu? 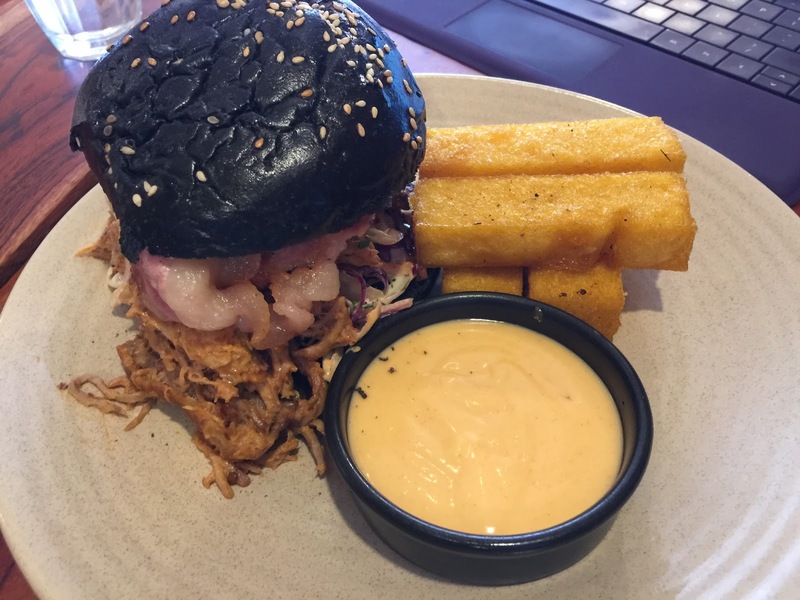 To find out, I ordered their Halo Burger, which is filled with chipotle pulled pork in a black sesame seed bun. The bun alone tells you that this meal was designed by someone with an attention to detail: the sesame seeds impart a lovely toasted aroma and flavour, and the aioli is tasty with a distinctly delicious garlic flavour. The pork itself is flavoursome, moist and nicely seasoned. The rasher of bacon, which makes an already good burger even greater, together with red onions, are a nice touch which introduce additional layers of flavour. The polenta chips are a nice change from the ubiquitous potato version you would normally see accompany a burger, and are also nicely seasoned to boot (while other restaurants may serve polenta chips/sticks, they are more likely than not to be bland and require dipping sauce to work from a flavour perspective). What's more, these ones maintain structural integrity and don't fall apart when poked with a fork (I dunno - I like structural integrity ...). While it's one thing for a good chef to be able to create works of art with a generous budget/price-point on hand, I'd like to suggest that it is an even bigger challenge and achievement to successfully pull off something special when you have to create a burger at a $20 price point. Morgan has certainly done it here. While I do hope that Morgan does eventually move onto a restaurant that allows him to develop his great potential, I look forward to my next delicious meal at Halo Espresso! This was honestly the wrong time for me to see this post. Already so hungry and just this burger here made it worse. But good post anyways. Ramen Lab, Mount Lawley - best ramen in Perth?